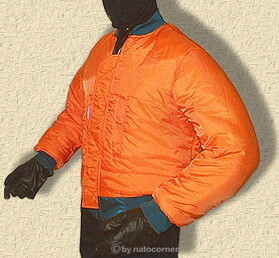 This jacket has a tensile strength because of its outer nylon skin. -a heat insulating hollow fibre. To avoid the capillaries effects the hollow fibre is worked up with silicone. Additionally the lining isn´t simply put in but solidly sewn up (water-repellent but still washable). -often an attribute for "made in/for USA". The knitted waistbands are worked up doubly with sturdy and steady elastic fibre. The two inner & outer pockets (which can be shut) as well as an arm office complete the classic jacket. 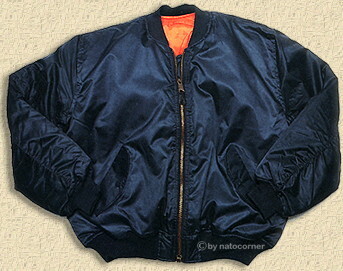 The first nylon flight jacket was called B-15 and was designed in 1944, during the WWII. The MA-1 was approximated to the B-15, but manufactured without a collar. Between 1949 and 1950 the MA-1 was issued to the AIR-FORCE pilots, the NAVY pilots and the flight crews. Today, the government orders CWU 45/P (Nomex) jackets for pilots and flight crews only. 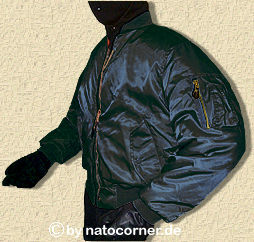 Nowadays MA-1 jackets are issued for the use of ground crew personnel only, such as security police, base maintenance and line repair personnel. (up to EURO 8.00 forwarding costs). click here to the shop.